While we have spent several years posting free research-backed content at our website, lots of people are looking for a more serious, systematic approach to tackling their body image issues. Beauty Redefined reaches thousands of people online every day through social media and at live speaking engagements, but we can’t reach everyone in person. After years of development, we have solved that problem with our new 8-unit online program for individuals! The Beauty Redefined Body Image Resilience Program uses text, images, video, in-program journaling, challenges and online group discussion while allowing participants to track their own personal progress, It guides girls and women, ages 14+, through the life-changing process of developing positive body image and body image resilience in manageable steps. You can use this program at your own pace, on your own timetable, since all of the content is open and available to you once you purchase your membership. This 8-unit online program was developed and tested in our 2013 dissertations at the University of Utah and has been continuously updated and upgraded since then. It guides girls and women through the process of recognizing harmful messages in media and culture about female bodies; reflecting on the ways those ideals have impacted their lives; redefining the ways they think about beauty, health and worth; and actively developing body image resilience through four sources of power. Throughout this active and self-reflective process, you’ll be able to see changes in your perceptions, beliefs and behaviors through your own documentation. 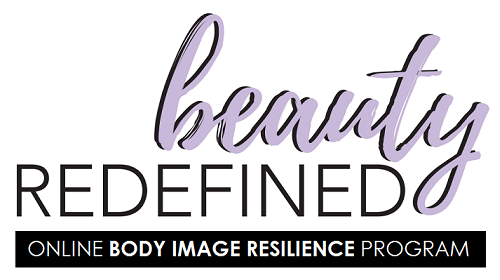 Are you ready to discover your own potential for body image resilience? For a one-time cost of $149, individuals receive unlimited access to the Beauty Redefined 8-Week Program for one year. If you are a group leader or educator who would like to inquire about educational licensing to large groups, please email us through the contact us page. Memberships cannot be shared among users. Once payment has been received through the link below (via PayPal or credit card), members will receive access to all program content. Please register HERE to continue!